I just hit 30 (years old) a few days ago. I used to work as a marketing executive for a non-profit organisation but I have left my job recently. I need coffee to start the day and occasionally, camomile tea to calm my nerves. I am left-handed and I like taking pictures! First of all, I am physically fit. As we age with the passage of time, our bodies will inevitably reach a point where they start to deteriorate (regardless of our best efforts in bodily maintenance). Such a trip will definitely take a toll on me if I do it when I am older, say fifties or sixties. Now that I am still young, fit and able, why not? Secondly, it is because I feel that bucket lists are overrated. A bucket list is defined as a catalog of items one wishes to accomplish before he or she is dead. Most people have one and it is common to hear people say things like “oh, how I wish I can do this thing before I die!” or “I shall visit that place before I die!”. But only a handful actually have the eagerness to attempt and strike those items off the list. Perhaps people generally feel that death is not going to knock on their doors anytime and they have the luxury of time to complete the list? Or maybe bucket lists are merely a feel-good/romantic idea to possess? Because it is a sabbatical break. I have always wanted to do this since four years ago in 2011 (I didn’t do it back then because I didn’t have the guts or money). And since I just left my job, what better timing to go for this crazy journey before looking for a new job? In the context of Singapore, to resign without securing the next job can often be seen as an insane thing to do. Believe me when I say that it wasn’t an easy decision to make and job security/career progression/financial stability are all genuine concerns on my mind. Last but not least, I think this is quite an awesome way to celebrate my own thirtieth birthday! Don’t you think? My journey begins as I step into Malaysia and travel northwards to Thailand, Laos and Vietnam, visiting cities like Bangkok, Vientiane and Hanoi. 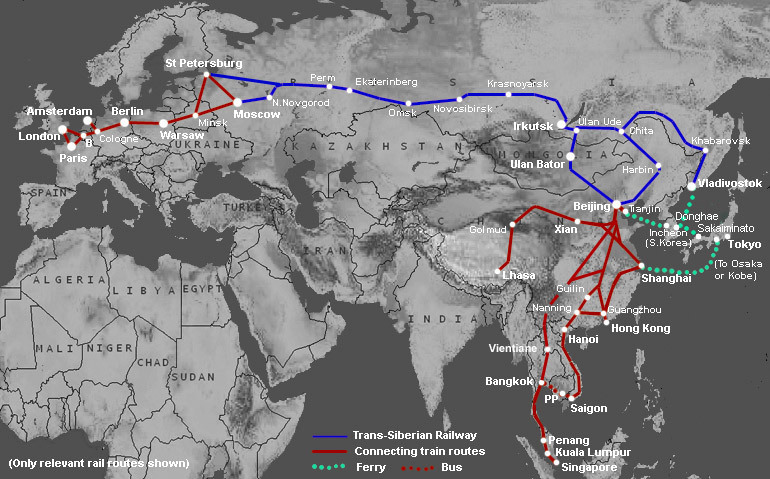 Then I will head towards Beijing, China where I take a train ride across the famous Trans-Siberian railway to Moscow, Russia. From there, I will make my way across a few countries in Europe before taking a train across the English Channel from Paris to London. I will tour around England and Scotland for a couple of weeks before flying back home to Singapore. The entire journey will take me approx. 86 days, which include stopovers at cities for sightseeing. As for the exact cities where I will be visiting, I can’t say for sure now. I just want to keep it a little open-ended. Reckon it would be more fun and exciting that way, don’t you agree? Anyway below is a map that shows the route (in red and blue) I will be taking for this trip in general. Just a visual reference of what I am talking about. I remembered one day I was chatting with an acquaintance (who’s in his mid-fifties). After hearing about my travel plans, he told me he once thought of doing the same thing too. But because of other commitments & priorities, he wasn’t able to do it. Somehow I could feel that he regretted not doing it when he had the opportunity. I didn’t want the same thing to happen to me. This is something I want to do before pursuing other priorities in life. Anyway welcome to my blog and thanks for spending your precious time reading this article. I will be sharing more articles bout my trip (e.g. preparations, route information and budget required) soon so do check this space regularly for more updates. While the original intention of this blog is to serve as an archive for my thoughts, feelings and any other information about the trip so that I can reminisce from time to time, I hope that you will like my sharing and find it useful to you in any way possible. This journey is not something new. I am not the first person to do this and I am definitely not the last one to attempt it. Hi, first of all i’d like to congratulate u on ur decision and I’d like to wish u the best of luck on your journey. May I inquire, how much would be your estimated expenses for this, at least for the train rides? Thanks… this would guide me how much I need to save to do this myself. Good Job Mate… I like your guts.. Enjoy your journey… its bound to be AMAZING..
Dear Benson, I wish I am making the trip too. Maybe soon, I don’t know. I would love to know about everything, EVERYTHING 😁 because I know if it is safe for a girl travel that distance alone. Best of luck Benson. Take lots of pictures. Good job bro! Once you involved in responsibilities and priorities, things like this won’t be a reality unless you are retired from those chores. All the best and take care dude! Just ….. ENJOY the journey! Take good care of yourself too. Everyone’s life is a bucket list in some way or other, you have done well to reach 30! Now go out there and see what half the world really looks like and don’t for a moment close your eyes for those 86 days. You’ll miss something inspiring. Good luck, Benson! Are you going to start a Facebook page too? Wonderful initiative. All the very best. What a grand way to celebrate your 30th. if im not mistaken ur taking about 46 days for your journey? sorry im a vet not a mathematician and im from malaysia too and supporting you! Greetings from Malaysia. I’m very keen to know all kinds of informative tips from you regarding this wonderful trip of yours. Im really disappointed to this norm that girls can’t travel alone and all. I would like to break the stereotypes and fulfill my wish of travelling the world. My best wishes for you.Enjoy it as much as you can and have a safe trip. Good for you! Gotta live the adventure, right? I’m sure you’ll have a lot of fun =) And will learn a lot of things. You should consider writing a memoir of this journey too. very inspired journey… good luck! This has not been updated for ages. Any news about Ben and what happened to his journey? I was excited to return to his blog after months of restraining myself to read wonderful stuff… Only to find the same pages I read when I last visited. Hoping that Ben is all well. Wish God would fulfill your noble dream with good faith, please email me at rahmatghani@gmail.com along your journey. All the best bro! WTG Ben On yr Decision. ALL the Best & Keep SAFE. You’ll have lots of fun! Enjoy the ride of a lifetime :). Keep the one backpack as light as possible ya. Best wishes from another overland explorer pal in KL. I recently did the same trip in two months. For those interested, here is my blog tracemytracks.wordpress.com. Will be glad to answer your questions! And also to hear from you Ben!